Prayer is the spiritual life-blood of a Christian. Direct, intimate, honest conversation with the Creator is critical to maintaining proper balance in life. So how does this whole prayer thing work? Are there certain buzz-words I can use to guarantee positive results? How many times do ‘God’ or ‘Lord’ need to be used so that my prayer is acceptable? Questions like these are not only common, but they haunt the subconscious of even the most devoted Christians. The sad thing is, using questions like these to gauge the effectiveness of your prayer life are a lead weight around its neck. This is why we are starting a new series today aimed directly at weeding through the over- (and under-) spiritualized mess our opinions created. The next few weeks will interpret a series titled, ‘How To Pray’. When you pray, do not be like the hypocrites; for they love to stand and pray in the synagogues or on street corners so that they may be seen by men. Truly I say to you, they have their reward in full. But you, when you pray, go in to your inner room, close your door and pray to your Father who is in secret, and your Father sees what is done in secret and will reward you. And when you are praying, do no use meaningless repetition as the Gentiles do, for they suppose they will be heard for their many words. So do not be like them, for your Father knows what you need before you ask Him. Jesus goes on to create what we now know as ‘The Lord’s Prayer’, but that’s far enough for today’s message. Let’s start from the top, verse 5. Do not be a hypocrite (well, duh)……standing and praying in the synagogues and on street corners so they can be seen (huh?). The religious élite of the day earned their ranks being the loudest or the most animated; ultimately the most popular. Their popularity among their peers is their reward, the obvious achievement of their goal. Once again, the critical importance of motive arises. Man is concerned with what you do, God wants to know why. Praying loudly, even praying publicly is certainly acceptable, provided your motives are externally driven. We now know how not to go about praying, so what are we supposed to do instead? Go into your inner room and shut the door. Okay, so I need to shut myself into the central-most room in my residence as if the National Weather Service just issued a tornado warning? Well, sort of. The original Greek word being used here for ‘room’ is directly translated ‘storeroom’. Residential architecture in this time period was obviously more primitive than modern architecture; no central air, the whole dwelling essentially a mud room. Doors and windows were simply openings, providing easy access to rooms, but also constant ventilation to the house. Only one room in the dwelling included a working door, the storeroom. The purpose of a storeroom in residential architecture is exactly what it sounds like, to store household valuables, including food storage. Jesus communicated importance of intimate, private conversation with God by equating it to the contents of the most guarded room in every home. Pretty heavy stuff. Last, to the nuts and bolts of a prayer, the actual words to use. Don’t be like the Gentiles who believe the wordier the better for effectiveness. God already knows what you need, He’s just waiting to hear your acknowledgement. I once attended a church where one of the pastor’s popular picks for closing services was a guy who opened and closed every phrase with ‘God’, ‘Lord’, or an occasional combination of both (I suppose to mix things up). EVERY PHRASE. Despite being some of the longest public prayers I’ve endured, it was slightly entertaining to tally how many times ‘God’ or ‘Lord’ could be mentioned in a single prayer. This guy is in undisputed ‘God, Lord’ champion. Be real, that’s all God asks. The language we use as we pray shouldn’t be any different from when we talk to our best friend. God knows everything you’re thinking as you pray, your words don’t need further explanation (for better or worse). I’ve interpreted today’s message in a literal drawing. 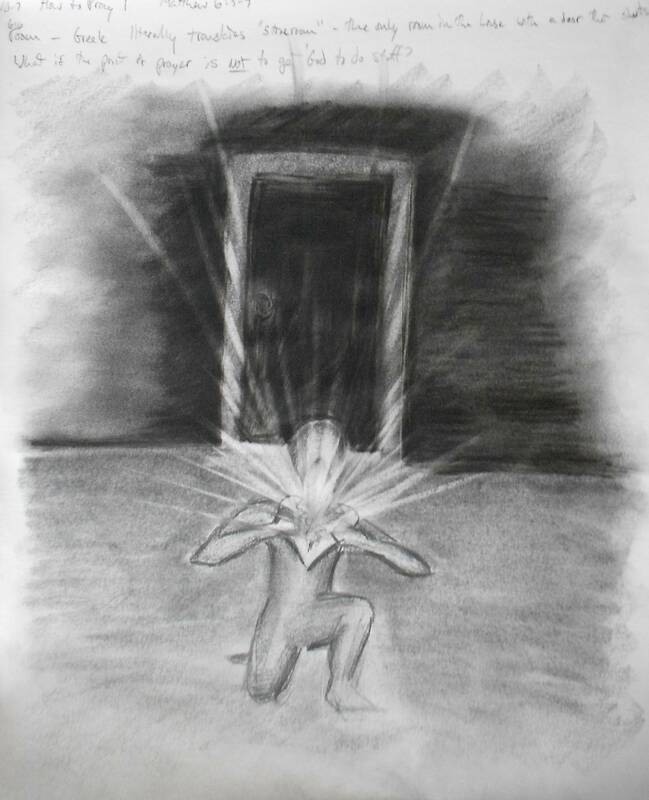 The figure is closed in a room, obvious by the closed door in the background. The darkness implies solitude, the figure is closed in the room alone. As the figure kneels, it throws its head heavenward and grasps its chest in Superman fashion, opening its soul. Further inspection of the image reveals the figure is tearing its own heart open. The bright rays of light explode from the figure’s core in a vulnerable surrender of its total being. Honest, intimate, private communication with God, in your storeroom. This is sustenance to a devoted life.